"When I was still just a kid, I remember my father telling me what he thought it took for a man to be happy. Simple things, really. A wife he loves, a decent job, friends and neighbors who like and respect him. And for a while there, without even realizing it, I had all that. I was a happy man." MPAA Rating: R for violence and language. What do you get when you take two brothers, a friend, a pregnant wife, a cop, a fox, a farmer, a chicken, an airplane, a dufflebag full of money, and a bunch of black crows? A Simple Plan. But this unexpected little gem, brought to the screen by famed blood and guts director, Sam Raimi (Evil Dead trilogy, Quick and the Dead), shows that as in life, nothing is ever THAT simple. You see, the two brothers are not very much alike. One is younger, educated, married, expecting, and straight-laced (Hank), while the other is older, a bit slow, out of work and pathetically single (Jacob). The latter has a drinking buddy (Lou) with whom he has far more in common than his own brother, neither of which like each other very much. With all that in mind, after an accident avoiding a chicken-stealing fox, the three come upon a downed plane with a dufflebag full of money. "It is the goddamn American dream in a gymbag," says Lou, the drinking buddy. "You have to work for that," says Hank. "Then THIS is even better," replies Lou. Words are exchanged, ideas are argued, and a fateful decision is made. A black crow, the lingering motif of this film, lurks in the foreground, a harbinger of things to come. And with that decision, these five folks (two wives included) from a small town are now faced with life in a fishbowl of their own paranoia. And that's as much as I can get away with without ruining the rest of the movie for you. 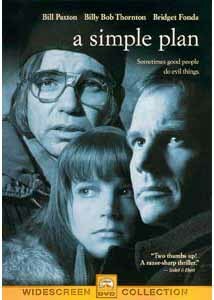 A Simple Plan boasts some outstanding performances: Bill Paxton delivers his best performance to date as Hank Mitchell; Billy Bob Thornton simply melds into Jacob Mitchell (can you say robbed?! Hello, Academy! ), further defining him as one of the great actors of our generation; Brent Briscoe is Lou —period; and Bridget Fonda, who has probably not received enough credit for her portrayal of the pregnant Sarah, which I consider to be the centerpiece of this entire drama. "You have to go in the morning so that when it storms later it will cover your tracks...It just being careful. That's what we have to be from now on—we have to be careful. We have to be thinking ahead all the time." Image Transfer Review: This is a single-sided picture disc with an anamorphically enhanced 1.85:1 aspect ratio. One word: Phenomenal. Minor cases of aliasing distortion and edge enhancement do absolutely nothing to distract from this near pristine print and transfer. Seriously, I had to look for something bad to say about this transfer. 'Nough said. Audio Transfer Review: This disc contains both Dolby Surround 2.0 and Dolby Digital 5.1 audio tracks, to which I only listened to the latter. This is not an overwhelming mix, but it is effective when it needs to be. In fact, both the fox in the hen house and the first crow scenes attracted the rapt attention of our cat—it was that convincing! The dialogue is easily understandable and well placed. The fact that this mix is not overwhelming allows the eerie and beautiful incidental musical score to become a major contributor to this film. I truly think that, as with Carter Burwell's score for Fargo, this film would not have been nearly as engaging without Danny Elfman's tremendous score. Extras Review: Unfortunately, we are robbed of anything more than the original trailer as far as extras are concerned. A simple shame. It is unfortunate that Paramount chose to put this excellent film out with lack of at least a director's commentary, and I can only hope they will re-release this disc as some later point. In the meantime, we can be thankful that Paramount has graced this disc with a 16:9 enhanced transfer, which allows me to state that the movie (and transfer) itself makes A Simple Plan worth owning.